A 3-weeks’ ringing holiday in North America and Canada has just ended for eight ringers of the W & P D.G. In fact the six photographed here travelled down from Heathrow for the AGM, having landed only a couple of hours before and without any real sleep for 40 hours. 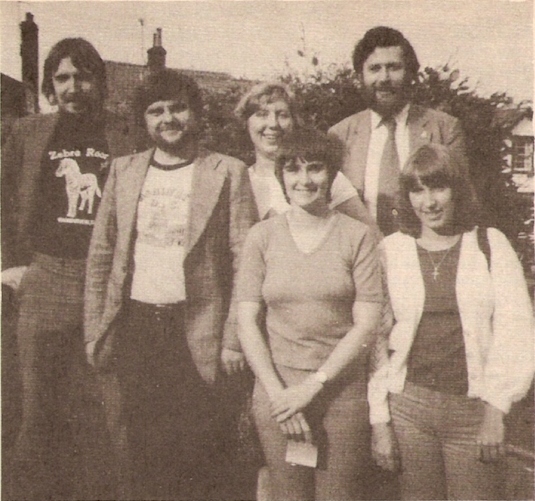 Back (l. to r.):- Roy le Marechal (Bishopstoke), John Colliss (Winchester), Pauline Chapman (Salisbury, St. Thomas), Barry Fry (Brockenhurst); Front:- Alison Surry (Winchester), Ann Bennett (Bishopstoke). At the Winchester & Portsmouth D.G. AGM on July 5 the meeting gave its consent and blessing to ringers in the Channel Islands if they decide to form a Channel Islands District of the Guild. 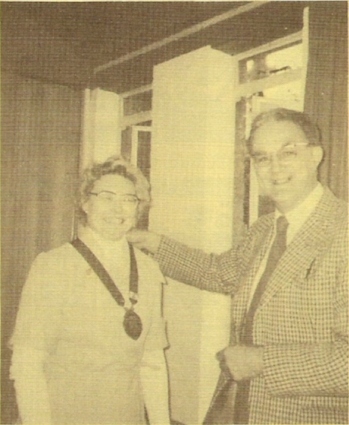 History was made on July 5 when, following a ballot, Mrs. Gilian Davis, of Christchurch Priory, Dorset, was declared elected Master of the Guild - the first lady ever to hold that important office in the W & P. The other candidates were Mr. David Forder and Mr. Barry Fry, both of whom have held the office of Guild general secretary. The retiring Master, Mr. Kenneth S. B. Croft, did not seek re-election because he was uncertain of remaining in the area for the 3-year period required, and also because he is physically tired having led the Guild up to its centenary festivities and also for the visit of the Central Council. Mr. Croft was thanked and applauded loudly for his excellent leadership. He has also retired from Central Council membership to which Mrs. Davis was (later) elected. The retiring master, Mr. Kenneth Croft, invests Mrs. Gilian Davis with the badge of office. Archibald Alliston, Fred Barron, Harry Blanchard, Arthur Bone, Charles Burridge, Bernard Castle, Charles Denness, Ernest Dowling, William Godden, Bishop Kenneth Lamplugh, Alice Sullivan (née White, the first lady to ring a tower bell peal) and Dr. Bruce Williamson. The general secretary (Mr. Barry Fry), read the minutes of the centenary meeting in Basingstoke, and only one item regarding a peal of Superlative was raised from them. The election by the Guild’s Executive Committee of Mr. D. C. Jackson as a Central Council representative to replace Mr. Roger Savory, now living in America, was ratified. Printed in the annual report book, already distributed, were the reports of the general secretary, hon. treasurer, peal recorder and librarian, all of which were approved. The question of the valuation and insurance of the library were discussed and the Executive Committee is to see to the latter without undue delay. Mrs. P. Nabb was applauded for her excellent work with the library. Miss Susan Hartless, speaking for John (her father) who, although present, was unable to speak because of a throat infection, gave additional details regarding the striking competition when that Committee’s report was accepted, and Mr. Robert Cater, reading its report, also spoke of the work of the Guild’s Ringing School and its programme for the future. That the Committee which was appointed for the visit of the Central Council had now been disbanded, was stated by Mr. Cater, who gave a brief report on the visit and its satisfactory conclusion, whilst a comprehensive account of the Council’s deliberations on May 27 was given by Mr. Derek Jackson. He also gave details of the costs involved for the visit which from a financial point were very satisfactory, a profit of about £400 (plus) having been made, mainly from the tombola. It was decided to hold another similar draw in 1981, the funds received to be allocated at the discretion of the agm but probably for the Bell Restoration Fund. That £3,000 in all is on deposit was confirmed by the hon. treasurer when the report of the Trustees of the Bell Restoration Fund was given and it was agreed that this money should be invested more prudently, it being pointed out, however, that funds must be available at reasonably short notice. Consideration was given to three applications for grants from the Bell Restoration Fund and, after a considerable debate and a proposed amendment had been lost, it was eventually agreed that the following sums be allocated (a) to Yateley (£6,500 shortfall) £400; (b) Minstead (£6,500) £400; and (c) Blackmoor (£650) £40. Work had been completed at (b) and (c) but there was a hold-up in the rebuilding of the tower at Yateley, where the church had been destroyed by fire and was being rebuilt. A committee is to be formed to arrange a dinner and, possibly, other social functions in 1981. Hon. Life membership was conferred on Messrs. Jack Mussell (Breamore) and W. Clift (Bramley) who have each completed 50 years membership of the Guild. Mr. Cater explained the arrangements for the Central Council’s Ringing School in August and two names were drawn from a list of seven, these two to be sponsored by the Guild for the course. The establishment of bell maintenance teams on an area basis was briefly discussed but no action was taken. Mr. Philip Taylor of Slough was present but is soon to move back into Hampshire and is hoping to print a revision of “Church Bells of Hampshire”, help being promised in the preparation of this volume. A proposal by the Executive Committee that the rule concerning the allocation of peal fees be altered was discussed and it was eventually agreed that two-thirds of the (15p) fee be used for printing these peals in the report book and one third given to the Bell Restoration Fund. This reverses the original rule, it being pointed out that the cost of printing the peal details had considerably increased. [This also applies to peals in the Ringing World - Ed RW]. The officers for the next triennial period were then elected as follows: Mrs. Gilian Davies (Master); Mr. Derek Jackson (hon. secretary - replacing Mr. Barry Fry); Mr. John Colliss (hon. treasurer); Mr. Roy Le Marechal (peal recorder); Mrs P E Nabb (librarian); Cdr. W. A. Harris (report editor - replacing Mr. G. Nabb); Messrs. F. E. Collins and R. M. Esbester (Trustees, Bell Restoration Fund). Mr. Lester Bailey was elected auditor. Following another ballot the four representatives on the Central Council are Mrs. G. Davis and Messrs. R. Cater, A. Smith and D. Jackson. The retiring Master expressed personal thanks to the officers and members for their support and encouragement during his term of office and also to the various committee members who had worked well for the benefit of the Guild. He congratulated the new Master and other officers on their election and wished them every success and happiness in the years ahead. The W & P was a lively and progressive Guild and would, he felt sure, continue as such in the 80s. Thanks were also expressed to the Alton and Petersfield District, and the ladies who prepared and served the tea in particular, for their organisation. 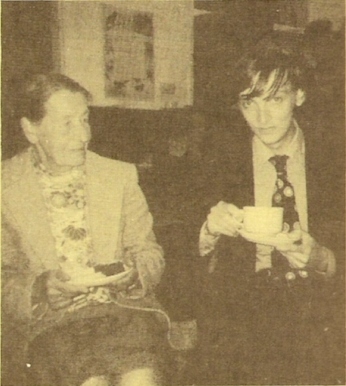 Tea-break.- Mrs. Joan Hall, O.B.E., and Mr. Mark Langtry, both ringers at Hambledon, Hants, enjoy a “cuppa” after the meeting. Mrs. Hall was awarded the O.B.E. in the recent Queen’s Birthday Honours for her services to the community, particularly with the Girl Guide Movement. She was applauded by the company when the announcement was made at the meeting. During the day there had been ringing at various towers in the District and a service in St. Lawrence’s Church at 12.45 p.m. was conducted by the Vicar (Rev. R. F. S. Eke). Ringing took place after the meeting at Alton (8) and Bentley (6). There were several amusing incidents during the meeting. At one stage John Croft decided to light his pipe. Unfortunately the box of matches exploded and the smoke from this - and the tobacco caused a smoke screen. All was extinguished however when a “No Smoking” sign was pointed out to the company. The meeting room was crowded and somewhat warm which necessitated having all the windows open. However, these were closed when the lovely ring of eight in the church adjoining rang out for a wedding at 2.30! It was almost impossible to hear the speakers and comments such as “Those darned bells” were made. The fact that in all only £5 had been charged as expenses by the four Central Council members attending the meeting at Penzance was commented upon by one speaker who felt reasonable payment of expenses should always be made, even if returned as a donation at a later date. It could deter others from taking on duties as a Central Council member if it were considered that legitimate costs should not be charged. The Master pointed out that representatives had a choice and if they did not wish to claim expenses, they were free to make such a decision. John Ingram of St. Mary’s, Southampton was thanked for his expertise in repairing the locks, cutting vents and making keys for the Guild’s Library housed in St. Mary’s. Derek Jackson, with his usual efficiency, gave “visual aids” when dealing with various accounts. Each sum and its relevance were clearly printed on large sheets of paper and displayed. The Ringing World editor (Charles Denyer) was invited to address the gathering about the financial affairs of the paper. He repeated parts of the previous week’s editorial about costs and suggested that if ever the Ringing World were in danger of ceasing publication because of costs, no doubt the various guilds and associations would come forward with the necessary finance to rescue it. However, it was a short-sighted policy and would be much more advantageous and helpful to build up the circulation of the Ringing World NOW! and a rescue plan would not then have to be put into operation.